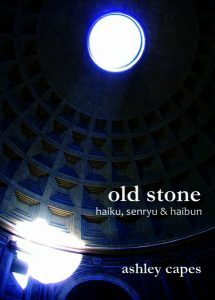 Here’s a few poems from the collection – ‘Vatican blues’ was previously published by CHO, and haiku & senryu appeared in Heron’s Nest and the Third Australian Haiku Anthology. ‘writing late’ was previously unpublished. At each bottle-necked corridor it’s one step forward, two steps back. The tour groups are a mass of wandering cattle, linked by their brightly coloured transistors. They bump into us, rigid, processional, lacking sense of purpose and trampling ghosts of the past. Occasionally an arm steals above the din and at its top, like a star on a Christmas tree, is the unblinking eye of a camera. It makes its theft and retracts in shame. See the first review over at the wonderful Adventures of a Bookonaut!